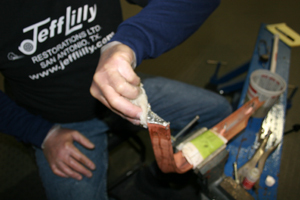 If you want your trim pieces to look perfect you may have to improve on the fit and quality of OEM parts. 1. 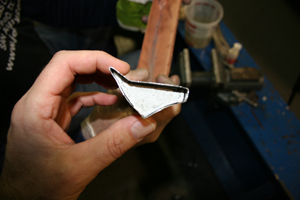 If the part looks like it is repairable you start by stripping off the chrome and nickel plating, down to the copper plating. 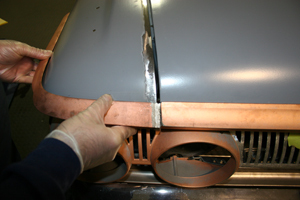 In this case the part looks OK but we are going to make it fit better. 2. 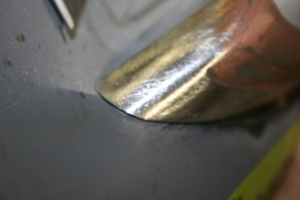 A close up shows that the gap between this eyebrow molding and fender edge is too big. 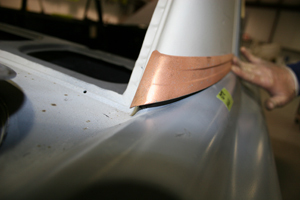 The fender has been adjusted to close the gap so now the trim piece has to be made longer. 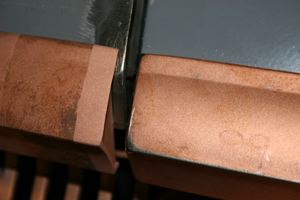 The piece will need to be re-chromed so a suitable welding rod and flux must be used. Go to Muggyweld.com for supplies. 3. 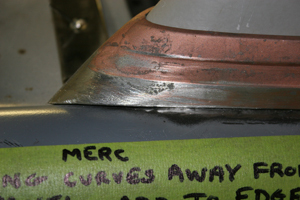 For this job we will use Super Alloy 1 flux and rod. 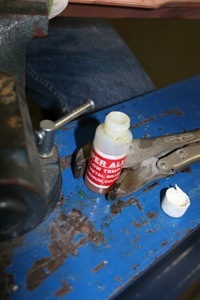 The flux comes in small containers so we clamped it lightly with locking pliers to keep it from getting knocked over. 4. 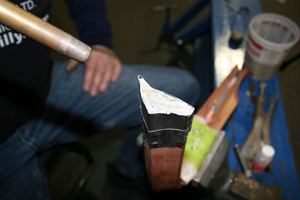 We wrapped the part with several layers of tape before putting it in a vise. 5. 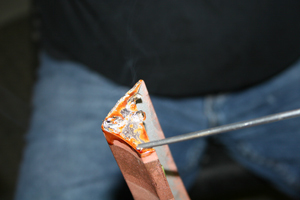 Then we dipped the rod in flux and used a propane torch (about 350 degrees) to ad material. 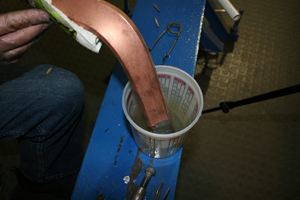 When the flux turns a toot-beer brown color it is time to swirl the rod around on the end of the work piece. 6. We want to cover the area with new material. 7. At this point we just want a layer of the new material and this is what it will look like when done. 8. 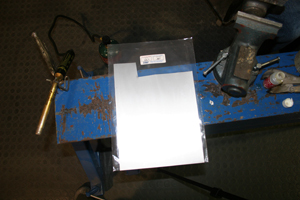 After it cools you can remove excess flux with a wet rag and then sand the edges down with 180 grit paper. 9. 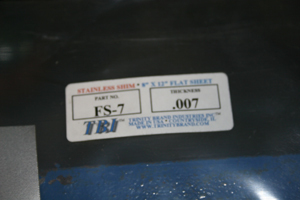 Now we use a piece of .007 stainless steel to make a mold around the work piece. You can buy it from McMaster Karr. 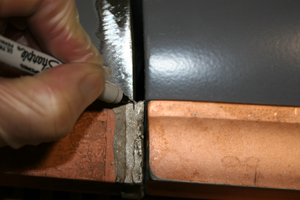 We use this product because it will not stick to the fill material. 10. 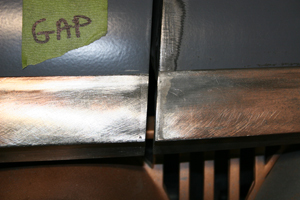 Cut off a strip of the metal to form the mold. 11. 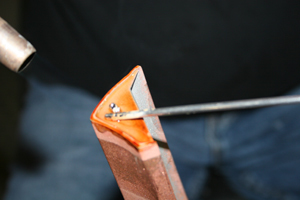 Then form it around the end of the work piece, letting it stick up about 1/8 inch past the end. 12. 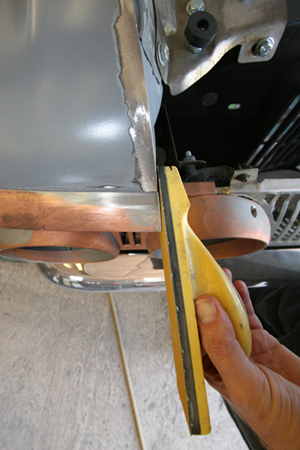 You can hold it in place with aluminum tape, used for heating and air conditioning duct work. You will find it at hardware stores. 13. Now we are ready to fill the mold. 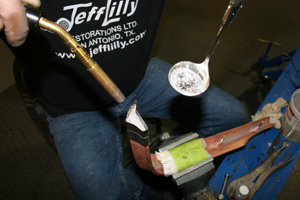 You can either use the torch to dab a little bit of rod at a time or melt some rod in a stainless steel ladle and pour it in after pre-heating the work piece. 14. 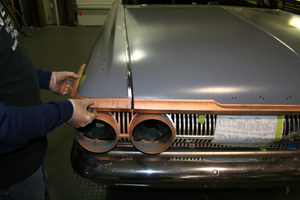 Here you can see the mold filled with new material. 15. Now we completely cool the work piece. 16. 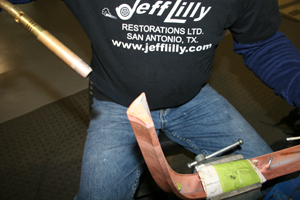 Then we remove the tape. 17. And then we use a small screw driver to remove the stainless steel form. 18. Here you can see that we have enough new material to shape the work piece. 19. 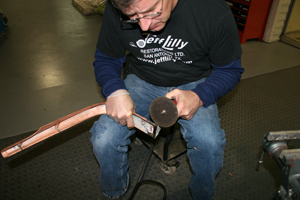 And here we make sure the piece is long enough to leave the desired gap. 20. Now we simply grind off the excess material and finish off the piece using a sanding block and 80, then 220 and finally 320 grit paper. 21. 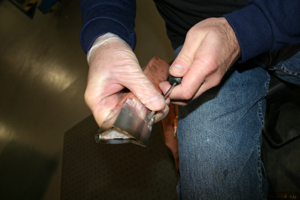 And here you can see that the piece is done and ready for plating. First it will be copper plated. Then it will be sanded with 320, 400 and 500 grit paper. 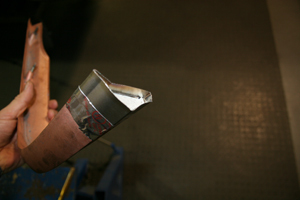 And then it will be sent out for nickel followed by chrome plating. 22. 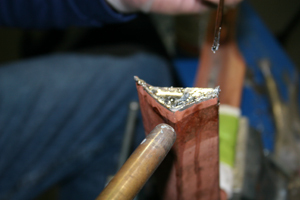 It is always a good idea to check the fit after copper plating because if too much copper is added you will want to remove some. 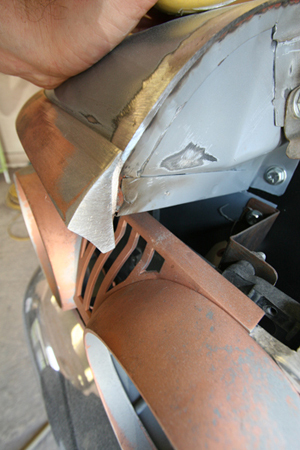 The nickel and chrome layers will be too thin to matter. 23. Here is another example of using this method to fill a gap. Notice the space at the bottom of this roof line molding. 24. And here we have added new material. 25. And here we have shaped the new piece for a precise fit.